I’ll be there, as will both of my kids! For the Eel River Soccer League, the tryouts are also tomorrow, with U-10 and U-12 at 10 a.m. and U-14 at 1:00 at Newburg Park. A children’s book. It’s getting a lot of media discussion. But somebody needs to warn Bunny Dad that the phones at jail aren’t secure, so that he doesn’t inadvertently cough up a recorded confession. Unfortunately, this is a book, if it isn’t too dorky, which may be of use around here. But it looks pretty dorky. This piece, entitled An Adagio for Boredom, is on display at the Institute of Art here in Chicago. My daughter, who was getting bored with the Lichtenstein exhibit and other art after an hour or two, viewed this thing and started cracking up. It made her day! I wrote my very first Letter to the Editor to the Pacifica Tribune in the spring or summer of 1982, not long before leaving for college. It makes me wince now, but I came across it in my old files recently, and decided to share it – documenting my early involvement with controlled growth issues – before we lost. I probably wasn’t much help. In fact, my mother was initially angry at me for writing it. She had been very involved at the City Council meetings and told me that it “undermined” her because everyone would assume it was written by her husband and not her son. I was actually basking in the sight of my name in print so I didn’t argue with her, but my brother did. Later she was complaining about it with some friends and they rolled their eyes at her, with one of them saying,”Gee Ethel. Most parents just have to worry about drug use, teen pregnancy, or dropping out of school. But your son, he writes political letters. Boy do we feel sorry for you!” When she got home she told me it was a good letter. Kind of like every picture your five year old draws is a good picture. 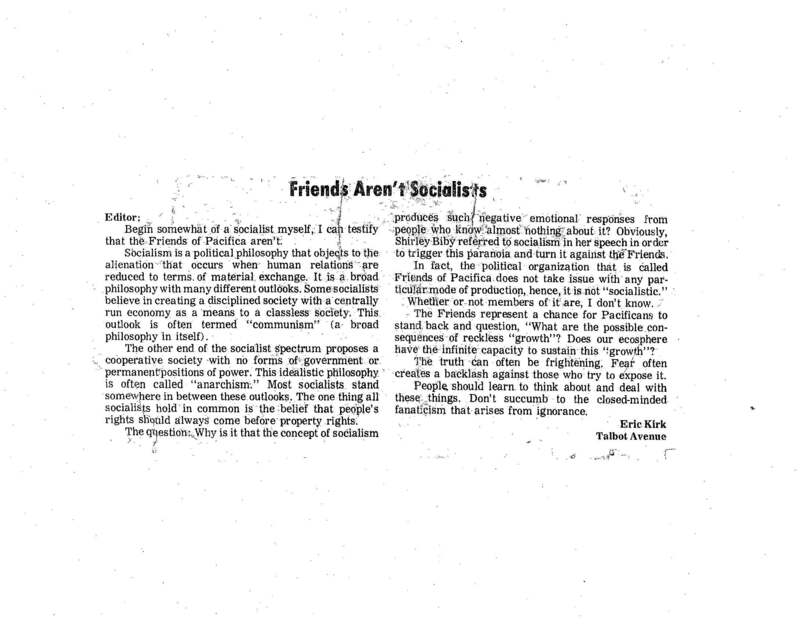 The letter was written in response, as you can probably guess, to another letter calling the Friends of Pacifica socialists. I’ve tried to be a little less patronizing ever since, but I doubt I’m always successful. At least I didn’t quote Erich Fromme or Milovan Djilas, which I was reading at the time and thought I had unlocked the secrets of the universe. I’m pretty sure the council folk knew I was a kid. But the subdivision was built anyway. I hope I didn’t screw it up for the Friends. Actually, I’ve come across college papers which make me wince even more. Like this letter, they were all typed on an ancient manual typewriter which had been used by my mother in college in the 1960s, complete with the circular eraser and brush, and the apostrophe above the number 8. Memories. You can click on it to enlarge. Obviously Sohum bucks the data in the study, but there is a red state/blue state divide in naming babies. One milieu more often opts for traditional names while the other is more likely to name their kids “Rimshot” or “Feedback” (that’s an obscure blue state cultural reference). But it’s not what you might think. The culturally conservative areas tend to opt for the alternative names. The reasoning provided by this NPR article sounds plausible. The reason for more outlandish-sounding names cropping up in conservative quarters is simple, Wattenberg says. Women in red states tend to have their first children earlier than women in blue states. A 23-year-old mom is more likely to come up with something out of the ordinary than one who is 33. Still, I’m pretty sure that despite the conservative reaction to the GPU/Plan A and all that, Sohum would be considered “blue” and we have some awesome alternative names around here. My favorite was in one of the local papers within the past few weeks. Seriously, isn’t Dandelion Lovemonkey the most awesome hippie name ever? A few years back a young man named “Alias” joined the KMUD Board. I asked him if he was named after the Dylan character in Pat Garrett and Billy the Kid (one of my favorite westerns). He said that I was the only person, up to that point, to guess the background of his name. Given the countercultural aspects of the movie, that surprised me, and then I remembered that it came out a few years before satellite dishes were massively available. Apparently there’s some sort of controversy in which a liberal pundit named Hilary Rosen made a silly comment about Ann Romney not working (for which she has apologized), and the conservative Catholic League saw fit to minimize the value of adoption-based parenting in their Twitter response. To their credit, the RNC responded appropriately. But the Catholic League was clearly playing dog-whistle politics here. As an adoptive parent I’ve met people who don’t view adoptive relationships as being as valuable or deep as biological relationships. I was even treated to a biological theory one time as someone told me that he knew a parent who had child by birth and another by adoption and the parent admitted to having a “closer connection” to the natural born child. I’ve yet to meet similar “mixed” family parents who will admit to the same thing, though I suppose it’s not something a parent would want to admit, even to him/herself if true. All I can say is that I love my kids so much it hurts. I have no basis for comparison as I have no children by birth (well, actually my children were in fact born, but I’ll rant about the terminology some other time), but it’s impossible for me to imagine a closer or “deeper” connection. Literally, there are people out there who will tell me I’m living in politically correct denial. Probably not many, but I’ve encountered enough of it to know that they aren’t extremely rare. Certainly a larger percentage of humanity than represented by AB- blood type. A remarkable thing happened at Clif’s event last night, and it had nothing to do with the campaign or even politics. My daughter was playing with a friend of hers – my daughter is seven and her friend eight. There’s a little side room towards the rear of the Scotia Inn dining hall and the kids were allowed to leave the grown-up world of politics to enjoy themselves. At one point I decided to check up on them. The story actually begins before last night. I had met her friend once before at Arts Alive a couple of months ago. She, my daughter, and two other girls were wowed as we veered as a group of parents and kids off of the main drag to visit artists in their studios – the first time I had ventured into those buildings during Arts Alive. One of the artists had a studio jammed full of paintings, so much so that it’s actually hard to navigate. I was nervous as the four girls started running through the place because it would have been easy to fall or trip and ruin a painting or two, but the artist wasn’t even fazed. He called the girls over to him, gave them a little bit of a tour and lesson on what he does, and then gave each of them a small painting as a gift. The girls were, of course, wowed. My daughter proudly displays her painting on her dresser. But it’s not Lilith’s first piece of original art. Her friend, whose family doesn’t have a large amount of money, was even more profoundly affected by the gift. I don’t want to name the artist, because I don’t want him put on the spot to give other kids the same kind of gifts. He does have to make a living. But I intend to return to his studio and tell him the story. And buy one of his paintings. Weird when you sit down to watch a cartoon from your childhood and notice what you either didn’t see or filtered out as a child. But does it make sense that Santa would promise Professor Hinkle a gift in his stocking after Hinkle tried to murder Frosty? After having watched and commented on Rudolph the Red Nosed Reindeer some time ago, I’m afraid to watch Charlie Brown’s Christmas! Earlier in the week I was in SF as my kids saw the Nutcracker (see my prior obnoxious adult-cynical snark on that magical production as well) with the grandparents. Jana and I took one of our rare opportunities for a romantic dinner. I had seen an ad for the Firefly Restaurant in Zyzzyva (SF’s best literary magazine). The ad is minimalist in form, with the simple slogan “food people eat,” which intrigued me. It’s located in Noe Valley on 24th Street, near Diamond, which is one of that last businesses on the climb towards Twin Peaks. Nice atmosphere, warm service, yummy food, and a decor which wouldn’t look out of place in the pages of an esoteric literary mag like Zyzzyva. It was packed, so definitely call for a reservation. On the subject of food, my family and I enjoyed a great cioppino tonight, made by the steady culinary hands of yours truly. I think I’ve settled on my favorite recipe, with a few tweaks. Start with this recipe I found at the L.A. Times. 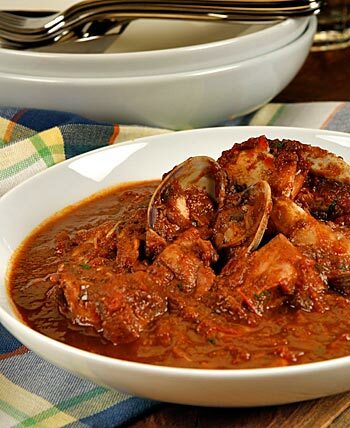 The problem I have with many restaurant cioppino’s is that they just don’t get that it’s supposed to be kind of a tomato-based bouillabaisse. They cook up a nice tomato stew and for some reason decide to cook the seafood separately and throw it in without any sea food base for the body of the broth – completely defeating the concept. Okay, unless you want to cook the crab live in your stew (which just seems nasty somehow), you have to precook it. But everything else should go in uncooked. I honestly don’t understand the recipes to the contrary. The stew was developed by the wives of SF North Beach fishermen, with pretty much everything coming out of the water thrown into the broth. It’s about the seafood, not your sauce. So this recipe does the right thing, but I found that it still lacked body, so I throw in a small bottle of clam juice at the wine – cook down phase, which does the trick. And don’t make my first mistake and use a Chianti for the wine. When they say “fruity,” you need something with body. Preferably a Merlot, but at minimum in body a Cabernet. The sharp wine flavor tends to linger if it’s a Chianti. The only tweaks I suggest besides the clam juice are the addition of a little bit of fresh basil at the end. I also double the onions, as I often do with stew or sauce recipes, and I throw in a little extra garlic. And I suggest that instead of a pound of clams or mussels, a pound of each. Again, it’s about the seafood. The photo comes from the LA Times recipe page. This morning, while my wife and son were on other errands, my daughter and I walked the Eureka Waterfront. It was a beautiful morning with an extremely high tide bearing lots of animal life in the Bay. The economic carnage is apparent in Old Town, with Hurricane Kate’s, Greystone Jewelers, the discount clothing place up on H and 4th, and even the candy store on the waterfront closing down. But walking hand-in-hand with my daughter was a welcome distraction, as were the festivities in Old Town as some businesses seem to be weathering the storm for the time being and drawing in some last minute Christmas business. We walked into Ramone’s where I could buy Lilith a cup of chocolate. After placing the order I could see the woman busy behind the steamer and she was pouring out syrups. I just assumed that she was working on an Italian soda order which had preceded ours, but what came out was a gorgeous presentation of green and red syrups over the whipped cream, and topped off with a candy cane. The delighted look on Lilith’s face will be one of the more pleasant Christmas memories I carry until I’m ready for the grave, and perhaps even beyond. As we headed to the table the music coming over the speakers brought me back. It took me a few minutes, but I realized it was a piece which I haven’t heard since I was a teenager. It was a simple electronic sans lyrics song off of one of Brian Eno’s old albums, either Here Come the Warm Jets or Taking Tiger Mountain. Can’t remember the name, but it triggered some old coming-of-age feeling I had as I was moving from Pink Floyd and Tom Petty to what I considered to be the more esoteric musical offerings. My daughter finished her hot chocolate and walked around the room looking at the artwork on the wall. She feels things very deeply, my daughter, which means she’ll feel more pain than most, but she’ll also get more out of her life. And I wonder if the song, when she hears it again in 30 years, will trigger a memory in her. All the usual hand-wringing about how commercial Christmas has “become” seems like just part of the tradition now, as it predates my birth. Miracle on 34th Street. The Twilight Zone episode about Santa Clause. By the way, what many people believe to be the “original” version of Miracle on 34th Street? Not so. It was actually the first remake. Here’s a clip from the original – all about the early version of the “link economy.” The voices are out of sync, but it’s still fun. (I have been duly informed and have confirmed that the Natalie Wood version is indeed the original. This clip is from a 1950s made-for-television remake. Only and hour long and no drunken Santa. And on a legal technical note, the Judge could have dismissed the case against Kris Kringle, without political repercussions, when the prosecution rested. While they had established that he believed he was Santa Claus, they forgot to establish that he was a danger to himself or others. Is Gimbel’s still in business? Well, it’s past midnight, and all the animals are talking in English.